Back in 2004, my home team Mainz 05 was finally promoted to the first division of the German Bundesliga after having been beaten on the last day twice in a row. First by asingle point, then by a single goal. It was a tragedy not many teams would have been able to digest, let alone beat the odds and be promoted the third time around. But Mainz 05 is a special club in more ways than one. It’s a club that, above all, celebrates playing the game. But, then again, maybe that’s not too surprising for a football team based in a town with even more carnival tradition than Rio (sorry Roberta ; – I agree that the Cariocas have come up with something unique – but we’re just a little older over here). However, even disregarding the „eagle“ thing (Eintracht Frankfurt, a regional competitor uses the bird as logo), I just could not come up with a decent hook using these words, and eventually, I put the idea to rest for a while. So it wasn’t until I read in the supporter’s web forum „„www.kigges.de“ that fans were trying to translate some German songs and looking for suitable English material a bit more specific than the classic from „Caroussel“ now that Mainz have been chosen to play in the UEFA cup qualifiers based on fair-play criteria that I decided to give the idea another go. I eventually decided against using Mrs T.’s poem, rewrote the lyrics, and suddenly everything fell into the right place – or so I think. 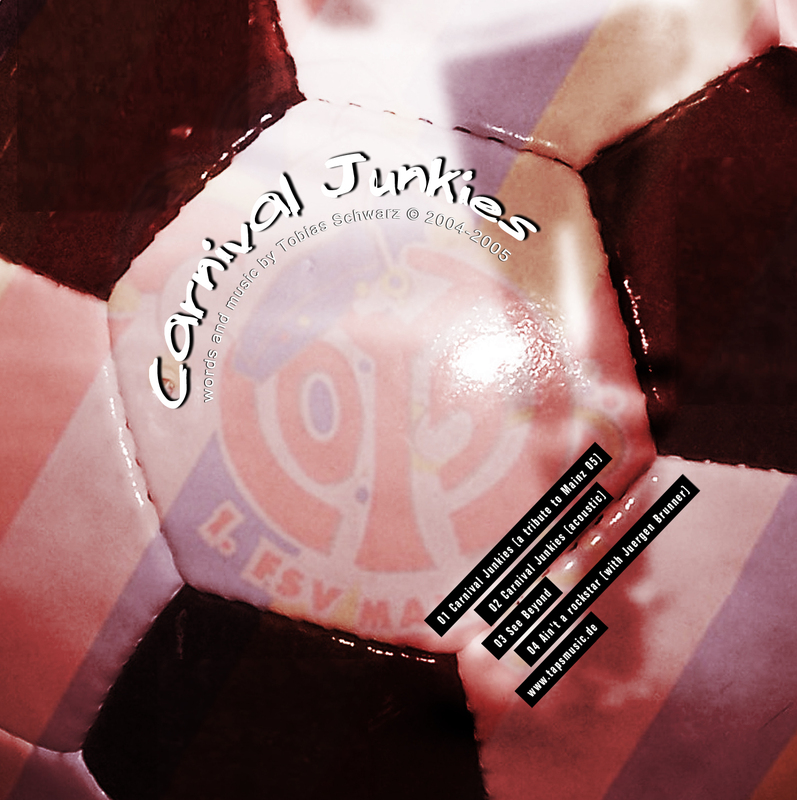 Now the song is called „Carnival Junkies“, a title that is not just a summary of much of what I think the team and their supporters are about, but also an hommage to the Californian singer/songwriter Cindy Alexander, who has written a song called „Carnival Junky“ back in 2001 (I think). For the time being, it’s a VST based, home-produced, demo and available as mp3 (128kbit, enclosed). Words, music and vocals by Tobias Schwarz, 2004-2005. Note that I have not been able to stand to sing due to a leg injury… Please contact me about ideas for commodification, should you have any. Enjoy! You’ll know it when we score!